Our combined portfolios consist of a 50/50 mix of equities and high quality corporate bonds (primarily Vanguard Intermediate-Term Investment Grade Fund). As the equity bull market gets longer in the tooth we have been contemplating switching our fixed income allocation to Treasuries. We are comfortable with the current risk level of our portfolio. If we make the transition to Treasuries does anyone have a good estimate of what mix of equities and Treasuries would provide a comparable level of risk (for example: 55% equities and 45% Treasuries) to our current portfolio? When I was looking at risk equivalents I used 10% for Short Term Investment Grade, 20% for Intermediate and 30% for VG's High Yield. It was based on something Larry Swedroe wrote a few years ago but nothing I have as a basis in fact. I think you have to evaluate, in your own situation, the shorter term volatility of corporates vs. the lost of dividend income by going to treasuries. If you have to sell bonds to feed your retirement that is one situation, only taking dividends in retirement is another situation. YMMV. In addition to midareff's comment, it can be helpful to evaluate the additional risk of corporates by looking at the performance mix of a portfolio of these asset classes in the last financial crisis. It's frequently and accurately stated that corporates have an element of equity risk in them. One can determine approximately how much additional risk is there by using treasury and corporate funds of comparable duration and finding an asset mix which behaved similarly. I used Vanguard Intermediate-Term Treasury/Investment-Grade funds. Portfolio #1 is 50/50 stocks/corporates while Portfolio #2 is 70/30 stocks/treasuries. This suggests that about half of the risk of investment-grade corporate bonds over Treasuries is the same as equity risk. The included graph demonstrates that in the period 2006 -2012, 70% equity/30% Treasury allocation provided the same amount of portfolio protection from the terrible equity collapse of 2007 - 2009 as a 50% allocation to investment grade corporates and 50% equity. This is a good point, if you use Treasuries exclusively in your bond portfolio you can include a higher allocation to stocks with no loss of portfolio volatility during a severe downturn. The period of 2006-12 is a great period to show the virtues of Treasuries which are the safest port in an equity storm. Looking at that graph you might wonder why bother with investment grade corporate bonds at all. The period from 2012 - 2017 is not such a great period for Treasuries. Over that 5 year span Vanguard's Intermediate Term Treasury Fund had an annualized return of 1.07%, significantly less than inflation, so that over 5 years ITT fund holders lost purchasing power. On the other hand during that 5 year span from 2012 - 2017 the Intermediate Term Investment Grade Fund returned 2.76% annualized, better than inflation and about 1.69% higher than Treasuries. The protection that Treasuries provide comes at a cost in this period of a persistent bull market combined with low interest rates. In short there are market phases when Treasuries shine and other phases when they underperform investment grade corporates and produce negligible or negative real returns. Long term backtesting is misleading because the lofty returns of Treasuries on long backtesting were in a period of ever decreasing interest rates and inflation which provided a huge tailwind for Treasuries. Today we have the opposite of that situation and it is expected to continue in the future which is likely to be a headwind for all bonds, especially low yielding ones like Treasuries. There is no doubt that Treasuries play a major role in a bond portfolio. Personally I believe, along with Bogle, that investment grade corporates can play a role in a bond portfolio as well. Many who choose to go 100% Treasuries in their bond portfolios are risk averse and do not choose to decrease bond allocation to 30% in as triceratop's graph. I suspect that often they choose a 50% or greater bond allocation and all of that to Treasuries. If half or more of your portfolio is losing to inflation and the rest, the equity portion, expects significantly lower than historical returns going forward, factors or no factors, that can produce low overall portfolio returns. Not a risk if you're very wealthy, but possibly a risk for those who need considerable real returns to meet financial goals in the future with average longevity increasing. In addition to midareff's comment, it can be helpful to evaluate the additional risk of corporates by looking at the performance mix of a portfolio of these asset classes in the last financial crisis. It's frequently and accurately stated that corporates have an element of equity risk in them. One can determine approximately how much additional risk is there by using treasury and corporate funds of comparable duration and finding an asset mix which behaved similarly. Looking at the corporate/Treasury performance during a financial crisis is a very good idea but doing it in the way triceratop presented is not the best way to approach the question. If you are going to look at a growth chart to determine "what's best" you are stuck with looking at the wiggles in the curve. Better to look at a rolling return chart. If you are not going to rebalance and buy stocks in a market collapse it doesn't make much difference. In that case triceratops method is just fine. But in my way of thinking I want the "blue" line. I can always rebalance my FI three to six month later. I don't suggest that one chooses Treasuries over Corporates. I suggest splitting your FI into two parts with one-half in each. I should say that my comment was meant to be a crude way to determine the portion of corporate bond risk which is correlated with equity risk in a crisis. It was not to suggest an allocation solely to treasuries. Note that Simplegift mentions another good resource for assessing the same question. Based on that analysis you may only obtain 18% extra rewarded risk if you hold corporates in a taxable account. The exact amount of premium you obtain from the state tax differential depends on your tax rate vs. the average. If you don't have the emotional ability to buy stocks when the S&P 500 is tanking your ratio of corporates to Treasuries matters little. I buy stocks when the stock market tanks. (i.e. rebalance.) Perhaps for the casual investor a more common response to a market crisis is often to sell not buy. Last edited by BlueEars on Sun Jan 07, 2018 12:28 am, edited 1 time in total. Here is another article I found helpful in deciding how much Corporate vs Treasuries in our bond asset allocation. My concern, possibly like SimpleGift, is with increased equity allocation, and not wanting to sell equities to re-balance, will increasing treasuries maintain similar portfolio risk? Our short and intermediate investment grade corporate bonds are in our T-IRA’s as well as some high yield bonds with the other being total bond index. Folios are retiree type @40/60 AA with tax exempt bonds , intermediate, limited, Pa. Long term. Plus some total bond index and Vanguard says it is tax efficient at just 0.09% expenses. Feell good with this mix too. Very interesting post. One more point to add. If you have an equity dominated portfolio, say 90/10, 80/20, 75/25, a case can be made for a very high or even 100% allocation to Treasuries in the bond portfolio. In that case you have considerable equity risk and also considerable upside appreciation potential from equities alone. It may be best to offset that increased equity risk with bonds that carry the lowest risk, Treasuries, and assume that the increased equity will take care of you returns. If, however, you're 50/50, 40/60, or 30/70, it seems entirely reasonable to me to consider a mix of investment grade corporates with government backed bonds to juice expected returns in that large part of the portfolio. After pondering this question myself a few years ago I selected Vanguard Intermediate-Term Bond Index Fund Admiral Shares as my sole bond fund, deeming it 'close enough'. The other 50% of my bond allocation is in CDs. This index fund offers a low-cost, diversified approach to bond investing, providing broad exposure to U.S. investment-grade bonds with maturities from five to ten years. Reflecting this goal, the fund invests about 50% of assets in corporate bonds and 50% in U.S. government bonds within that maturity range. Very similar here. IRA (besides VFIAX & VTIAX) is short, intermediate and high yield bonds, all indexed as available. IRA is 42/58 and should produce enough in dividends that I won't need to touch anything, as to rebalancing, for 3 years of RMD or so, which just started. Taxable is also retiree type @ 43/57 AA with IT Tax-Ex bonds. Roth is a play account at FIDO where I try and pick hot sectors and change them as the tide goes in and out. OTOH, as I mentioned in another thread, assuming zero growth and zero dividends we have 18 years draw in bonds and a significant monthly free cash flow over essentials. I would not sell bonds to buy equities if the equity market crashed since at this time (I'm 70) we have all we need and that old tune of risk what you do need to make money you don't need still plays in my head. Actually, if the equity market continues to climb I might sell more equities and buy more bonds. ... and then have to book more travel. Thank you all for your thoughtful comments. After reading through your comments I went to the Portfolio Visualizer mentioned early on (I had bookmarked it on my iPad several years ago but had forgotten about it.) I compared our existing portfolios (40% domestic equity, 10% international equity, 50% corporate bonds) with a mix of total market funds (48% TSM, 12% TISM, 40% TBM) going back to 2000. Our current portfolios were created in late 1999, after reading a number of postings by Larry Swedroe (on an old mutual funds website) and reading an article in Fortune magazine about Dimensional Fund Advisors and Fama & French's research. Prior to late 1999 we held an ever changing collection of stock and bond funds. After discovering that our 50/50 portfolios had higher returns, lower standard deviation, higher best year, better worst year, lower maximum drawdown, higher Sharpe ratio, higher Sortino Ratio and lower U.S. market correlation than the 60/40 portfolio of Vanguard total market funds we have decided to leave well enough alone. I also took a look at these two portfolios going back to 1997 (as far back as all of my funds were in existence) and got the same results. Ditto for the current full market cycle (2008-2017) and the current bull market (2009-2017). I have always known that our portfolios performed well, but I was surprised that they were considerably less "risky". The lower equity allocation more than cancels out the higher risk of the major value and corporate bond tilts of our portfolios. I paid particular attention to 2008, when high quality corporate bonds plunged and Treasuries soared. Looking at long-term corporate and Treasury bond returns (going back to 1929) I discovered that in prior major equity bear markets, corporate bonds generally held up pretty well. I'm no longer concerned that the next equity bear market will weigh nearly as heavily on high quality corporate bonds as was the case in 2008. Last edited by dkturner on Sun Jan 07, 2018 10:48 am, edited 2 times in total. From reading the book expected returns his review of the data indicates that the highest returning segment of the cooperate bond market (relative to similar duration treasuries) is the short term and the high end (BB) of below investment grade. The excellent performance of BB bonds is attributed to fallen angels. It seems a big part of the poor performance of cooperate bond indexs is forced selling of BBB downgrades at bad prices. That made me wonder if there is any fund that buys 5 year investment grade bonds and holds them no mater what all the way to maturity? It seems a lot of active bond funds have high turnover so are unlikely holding much to maturity. It does seem like a lot of the active funds keep there downgrades at least for a while. Yes, our folios are really 42/58 now too with this market. I’ve been selling a little stock the past year taking off some of the rich cream, so to say, just in case things go South in a hurry. Buying some bonds and holding some cash in our Prime MM to see what happens this year. The accumulation phase is over for us, and just maintaining what we accumulated is our objective now. This has got me thinking. I am not sure if I know enough or am smart enough to come to any conclusions, but the gears in my brain are turning, and I am interested in any input that would help my thinking. I recall (I hope correctly, but maybe not) John Bogle saying the Total Bond Market index had too much government bonds, and he would like to see more corporate bonds in the total bond market index. My AA is 50% gov't bonds : 50% Investment grade corporate bonds. My wife has her entire TSP in in the G-fund, based in large part on input on this board (the G fund has the volatility of a MMF with the return of intermediate term government bonds). But the reality is I (we) don't have any plan to rebalance from the G fund to stock. I am asking myself what difference does it make, what is the benefit of the G fund to us? Maybe I should (a) pull the money from the TSP G fund, roll over to Vanguard, and make it a useful part of our rebalancing plan, or (b) maybe I should use the G fund money as the first source for rebalancing, and keep the money in the TSP. Normally if the bonds fall to BBB- or below an IG fund has a limited time in which to sell (usually a restriction on how much sub IG debt they can hold). Bond funds inevitably sell bonds before maturity. There is a "Fallen Angels" etf. If there's another financial shock, the underlying assets will become very illiquid. I recall (I hope correctly, but maybe not) John Bogle saying the Total Bond Market index had too much government bonds, and he would like to see more corporate bonds in the total bond market index. My AA is 50% gov't bonds : 50% Investment grade corporate bonds. My wife has her entire TSP in in the G-fund, based in large part on input on this board (the G fund has the volatility of a MMF with the return yield of intermediate term government bonds). But the reality is I (we) don't have any plan to rebalance from the G fund to stock. I am asking myself what difference does it make, what is the benefit of the G fund to us? I corrected a key error in your post. The G fund does not have the volatility of a MMF with the return of IT Govt Bonds, but instead the yield thereof. This might not matter a whole bunch but one place it definitely matters is when talking about rebalancing. The result is that the truth is precisely the reverse of the bolded statement. Given that you have no desire to rebalance from IT Govt Bonds to stocks, it is better to be in the G fund than in treasuries. Treasuries have frequently been negatively correlated with stocks. Take 2008/2009. Treasuries rose sharply in value as equities plunged. The G fund would not have risen sharply in value, but instead would experience slower growth. Thank you, Garland, on confirming my perspective and bond investments. Had a 50/50 portfolio now heading towards 60/40. Moved some Total Bond Index (T-IRA) to I-T Treasury Index to mitigate risk (&/or my mind). With an equity dominated portfolio relatively early in the accumulation phase, you probably want zero bonds. Cash is a cheaper way to damp equity risk. Held in a highly liquid taxable account, it does a great job of handling personal finance risk. IMHO, if you have the investment discipline for it, your accumulation portfolio should be 6 months of expenses in cash + 100% of excess in equities. Perhaps a little more cash if you own a house, and if you buy a house it's with the minimal down payment. Yeah, it's aggressive, but it's on the sane side of things and can handle most life situations admirably. If you don't feel safe with that plan, go up to 12 months of expenses in cash before adding bonds to your investment portfolio. I do both; I hold a 90/10 portfolio but my 10% bonds is in high-quality bonds: intermediate-term treasuries. It doubles as my emergency fund. Yeah we probably have a very similar strategy in terms of numbers, but with a different ontology. Your 10% bonds covers your emergency fund, while my emergency fund covers your 10% bond holding. I prefer a cash e-fund since you need a somewhat smaller cash vs bond position to cover emergencies, which means more equity holdings, which is a portfolio improvement for people like me who are early in the accumulation phase. Right, it's just a coincidence that for me right now 10% of my portfolio is about 6-8 months of expenses. I agree about the ontological perspective. I'm 25 so 10% treasuries could be argued to be fairly conservative but that's without an emergency-fund so maybe not as conservative. Over the next few years as that treasuries position grows it will be harder to say it merely functions as an E-fund. You seem to be conflating two different things - equity risk and personal finance risk. With a high equity portfolio you want Treasures maybe even long Treasuries, because they tend to be inversely correlated to equities in "flight to quality" situations like a large stock market correction. If the stock market tanks you want your fix income to increase in value not remain stable so you can buy more stocks. Treasuries fit this bill better than cash. I assume by personal finance risk you are looking at something that adversely affects your finances but not necessarily the overall market like losing your job. For that situation "cash" may be exactly what you are looking for. But that has nothing to do with Treasuries vs. Corporates and probably has little to do with the this whole section which is "Investing - Theory News & General"
Equity and personal finance risks are related - if your personal finance is such that you're 99.9% certain that you won't need to touch your investment portfolio for the next 30 years, you can afford to take more equity risk. Conversely, if you expect withdrawals in a shorter timeframe, it doesn't make nearly as much sense to take risks. Within a long-term high equity portfolio, increasing your bond allocation does several things. It increases the worst-case valuation over the next 10 years or so, decreases the best-case and average valuation over all timeframes, and decreases the worst-case valuation once you're past 15 or 20 years or so of growth. If your personal finance is secure enough that you don't need to ever touch your investments, and you're young enough that you're investing for a long timeframe, this tradeoff is simply not worthwhile. In fact, you're probably better off adding a limited amount of margin loans, or effectively shorting bonds by maximizing a mortgage on your primary residence. Shorting long-term bonds through a mortgage is likely the better approach, though this can be difficult in practice since the real estate market is annoyingly illiquid. Equity and personal finance risks are related - if your personal finance is such that you're 99.9% certain that you won't need to touch your investment portfolio for the next 30 years, you can afford to take more equity risk. If you don't need to touch your investment portfolio for the next 30 years the experts recommend a small amount of Treasuries with that high equity allocation because of the negative correlation of Treasuries with stocks in times of stress. It has nothing at all to do with selling your investments to fulfill some unanticipated personal need. If you want/need assets for some unanticipated emergency having a nice stable emergency fund so you don't have to touch your investment portfolio then cash or equivalent is a good idea but it is a separate and distinct problem. Well, the experts here are wrong, given the consensus expert opinion on expected treasury and stock market returns and variance. Having a position in treasuries does give an anti-correlation boost, but it also drags down total return by reducing your exposure to the greater returns of the stock market. Under all future stock market conditions that are worth considering, you're better off with more equities instead. Maybe both views are reasonable. Having some bonds reduces returns a little bit in exchange for substantially reducing risk, because the low correlation effects are helpful. This is a tradeoff many make. But yes, of course bonds would in theory reduce "expected" returns (using "expected" in the technical sense). However, the low correlation effects have historically been particularly seen in things like long term treasuries - and "low" correlations are more like zero -- or slightly negative -- not radically negative like people would like. Corporates, due to their equity-like component, have higher correlations with equities - but in theory higher returns (which may or may not fully compensate for their higher correlations). In every historical 30-year period, 100% equities has outperformed stock/bond mixed portfolios. Holding bonds does not reduce your risk over a long holding period, since the difference in CAGR means that suffering even extraordinary drawdowns still leaves you in a better position. If you're worried about not having enough money in thirty years, buy stocks. Everything else is pointless for addressing this concern. Having been though a few 30 year periods in my life and noticed the profound changes that 3 decades brings in both markets and personal circumstances, I believe that it is very hard for anyone to be "99.9% certain that they won't need to touch" their investment portfolio for the next 30 years. First, there are profound behavioral issues, panic selling during a deep bear market is standard behavior for many if not most investors. Second, there are very low probability unpredictable but severe macroeconomic black swans from things like wars, political upheavals, revolutions, terroristic attacks, financial bubbles popping, etc., that can severely disrupt your life and financial circumstances. Over long time frames like 30 years the probability of unexpected financial black swans increases. I don't think most of us should do portfolio construction based only on being ready for black swans but financial planning should take them into account in portfolio bond allocation decisions IMO. Finally black swans can occur on a personal rather than macroeconomic level--things like accidents, natural disasters, job loss, disability, severe health/psychological issues, lawsuits, divorce settlements, marriage to a spendaholic, dementia, stroke, Alzheimer's, extended care, etc.. In short there are a lot of reasons why it's hard to be 99.9% certain of anything for the next 30 years except to say that what we expect to happen is in fact very unlikely to occur. I'm in favor of high equity allocation early in ones investment career. I was 100% in equities until I was almost 60 and had been retired for 10 years. The biggest part of my investment success which allowed me to retire quite comfortably at 50 was that I had the luck of the draw when it came to timing. I rode the greatest bull market of all time, 1982 - 1999. Later, when the crash of 2000 -2003 happened I was almost 100% in tech stocks that had made me millions and I proceeded to loss millions, fortunately fewer millions than I had made. I was unemployed at the time, no job available, too young for SS or Medicare, and was forced to sell tech stocks that had dropped 80% or more to make living expenses. That taught me a few things. First, don't mistake a roaring bull market for investment genius. Even if you've done very well, massively outperformed for a long time, humility is always an appropriate attitude when investing. Almost everyone who invests long enough will eventually learn it. A very experienced and wise investment guru once told Bogle, "Nobody knows nothing." Academic models, compelling graphs, brilliant financial advisors are not to be fully trusted because ultimately all fail from time to time. Second, because backtesting of equity versus bonds makes a strong case for no bond exposure over the very long term, that doesn't guarantee that it's right for you whatever your circumstances. IMO you learn what's right for you not just from gurus or graphs that make it all seem so clear and straightforward, but from experience. After a few bear markets and bull markets you can get a pretty good idea what's right for you when it comes to bond allocation. One size fits all is not IMO the right approach for everyone. This thread seems to have gone off the rails as it was originally about Treasuries vs Corporates, not bonds vs equities. I have had the same idea at OP and at some point plan to tilt toward Treasuries. I did some backtesting and found not only Treasuries but specifically long term Treasuries when paired with equities would seem to be ideal for rebalancing, reduced overall volatility, and higher returns. Of course, on their own long term Treasuries are very volatile, so you must be able to stomach the fluctuations from day to day which may be unacceptable to many BHs. Still, if you are interested in Treasuries for their negative correlation properties, long term may be the way to go. Why not cash, instead of LT treasuries, and a little more stocks to make up for the lost yield ? In theory, adding LT treasuries reduces overall volatility, which is appealing to me. I'm not a big fan of cash but I could be convinced. Our combined portfolios consist of a 50/50 mix of equities and high quality corporate bonds (primarily Vanguard Intermediate-Term Investment Grade Fund). As the equity bull market gets longer in the tooth we have been contemplating switching our fixed income allocation to Treasuries. Between a TRSY fund (VGIT) and a Corp fund (VCIT) there isn't much default risk. think the rises are short lived. An asset allocation primarily consisting of stocks is going to be extremely highly correlated with more stocks, whereas the correlation between stocks and long Treasury bonds varies over time (recently, negative). There's better diversification and higher portfolio efficiency when getting return from sources that are less rather than more correlated with what you already have. That's a result of basic MPT kind of analyses. Historically speaking, at least, it's better to mix in more term risk rather than load up more on equity risk to reach a target return target. Now, you could make a tactical judgment based on the current yield curve that maybe long-term bonds are not actually priced for excess return over cash over the holding period you care about. (That is, while current yield is higher on say a 20-year Treasury over a 1-month T-bill, maybe if you roll 1-month T-bills for the next 20 years, you get a higher return in the average future than on that 20-year Treasury purchased today. That's plausible and essentially states that there's not really "lost yield" as the spread wouldn't even make up for the higher future rates.) In that case, which is not the average behavior we've seen historically, there's not really a return advantage from extending duration. LT treasuries have higher volatility than cash. Depending on the correlation between LT treasuries and stocks, the portfolio may end up having higher total volatility. Yield curve is not really a problem, since I can select to have more stocks in order to achieve the same expected return as I would have with less stocks and more LT treasuries. That's the thing. Because of their non-correlation, LT treasuries combined with equities have lower overall volatility than equities plus cash, even though on their own LT treasuries are extremely volatile. You would have to hold a lot more cash to reduce volatility the same amount. Some people hold REIT but IMO the effect is negligible. LT treasuries have better return and stronger non correlation effect than cash. Backtesting 60 stock/20 total bond/20 LTT vs 60/20/20 cash, the 20 cash portfolio has 1% lower CAGR, 4% bigger worst year, and 3% bigger worst drawdown. But I admit, having such a fluctuating asset on the bond side scares me. On option would be to replace some of the equity with LT treasuries while maintaining the rest of the bond allocation. 1. In your ideal portfolio, you wouldn't want to barbell LT Treasury's with TRAD? 2. Could Interest rates increase to the point where LT Treasury's would be down so much that when the market did decline, LT Treasury's wouldn't be back up above one's cost basis? I hope that makes sense. Another way of asking is, could you be down so much in LTT that when they did spike you still wouldn't be at what you put into them. Yes, one could substitute TRAD for BIV. I don't have a strong preference for TRAD, it's just what's in my employer plan and their index funds all have high expense ratios. Your second question is the key. LT Treasury is the most negatively correlated with equities, but one could imagine a scenario where they both crash at the same time. That would be a nightmare. But at least in the backtesting data on portfoliovisualizer, that hasn't happened. The worst year for 60/20/20 with LTT is -16.7%. With 60/40 it is -20.2%. Also, since CAGR is higher, theoretically you would be playing with more money to lose in the event of a big drawdown. Still, there would be risk. One approach would be to substitute LTT for stock. And yet another "Attaboy!" from me, GW (I'm at 50/50 stocks/bonds and 50/50 corporate/government bonds). After doing numerous back tests on the Portfolio Visualizer it appears that, if you increase your equity exposure, a 50/50 equity/corporate bond portfolio has very similar returns, and standard deviation of those returns, to a 60/40 equity/Treasury portfolio over most periods - even for the last 10 years when, in 2008, corporates swooned and Treasuries soared. Familiarizing myself with Portfolio Visualizer is on my to do list so I need to ask. With a test like you performed what are the rebalancing parameters built into the analysis? The negative correlation with Treasuries and equities often occurs during "Flight to Quality" situations which revert to "normal" over relatively short periods of time. Rebalancing on say an annual basis would largely miss many of the positive effects. Annual basis is the default, but there are other options it includes. It doesn't make that much of a difference, but it matters through 2008 of course. OK "that much". How much for a 90/10 vs 100/0 rebalanced monthly? Both with the 10 as Treasuries and as corporates? 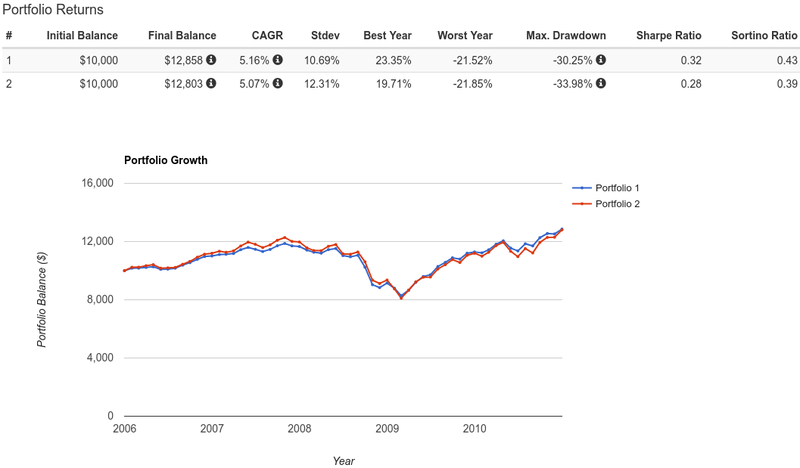 The Portfolio Visualizer gives you six choices for rebalancing, from monthly to no rebalancing. I ran my back tests using both annual rebalancing and 5%/25% rebalancing bands. I’m not a big believer in rebalancing because the majority of our equities are held in taxable accounts, which have quite low tax basis. I found Portfolio Visualizer to be a really interesting tool.